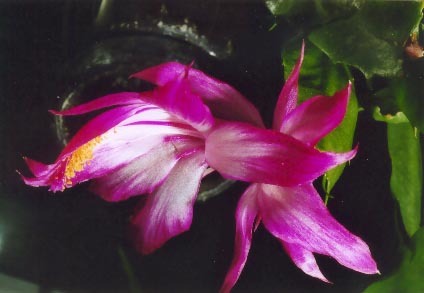 Schlumbergera orssichiana was described in 1978 : its discovery occured approximately 150 years later to that of Schlumbergera truncata and Schlumbergera russelliana. 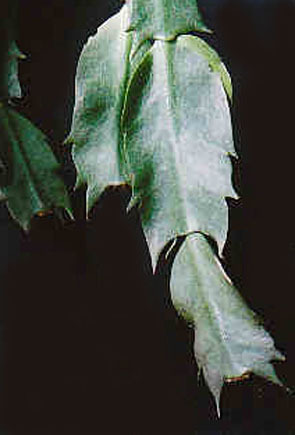 Its stems are strongly notched and their size is much larger than the size of the stems of Schlumbergera russelliana, very slightly larger than those of Schlumbergera truncata. Books mention that they are 5 cm long and 3 cm wide. I observe this size in my collection. The bloom is strongly zygomorphic and has a very unusual form with a very short, even non-existent floral tube. The blooming period in the northern hemisphere starts at the end of August through September. Thus, this Schlumbergera is the earliest one in autumn. 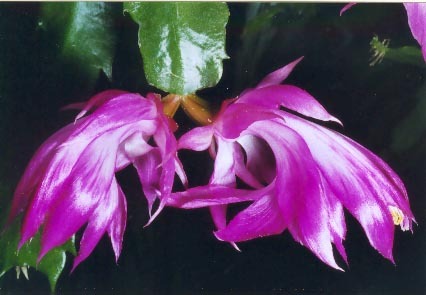 The hybrids of Schlumbergera orssichiana, and Schlumbergera truncata and possibly another hybrid, gave the splendid group Schlumbergera x reginae (the Queen hybrids to which I devoted a special page). It’s also worth noticing the group Schlumbergera x eprica (Süpplie) formed by hybrids of Schlumbergera russelliana and Schlumbergera orssichiana with other hybrids. I cannot talk much about it because I have only one specimen of this group whose flower has a form non-conform with that of the description: the hybrid would be unstable.